The combination of a diverse portfolio of precious metals streams and oil and gas royalties makes Franco-Nevada an intriguing stock, and a low-risk way to get exposure to gold and silver. 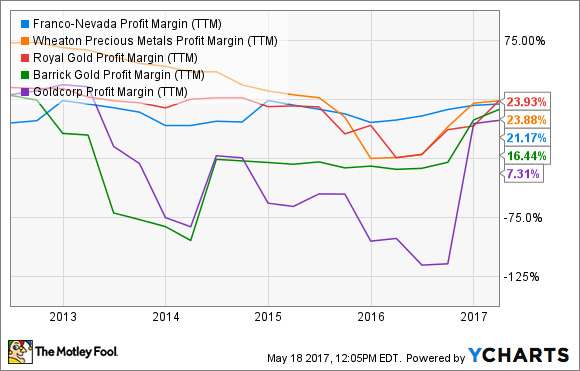 Investors looking for exposure to gold and silver have an intriguing option to consider: metal streaming stocks like Franco-Nevada Corp. (NYSE:FNV). Franco-Nevada is one of just three pure streaming companies in the precious metals space -- the other two being Wheaton Precious Metals (NYSE:WPM) and Royal Gold (NASDAQ:RGLD). Franco-Nevada's ultimate source of earnings the same as that of a miner – selling precious metals in the market. But the way Franco-Nevada sources its gold makes all the difference in how and how much money it makes, and the value it can unlock for shareholders. While investing in the stock of a gold or silver miner leverages you to the upside potential in metal prices, it also comes with a fair share of risks, as mining is a capital-intensive and a low-margin business. For instance, among the major business risks that mining giant Barrick Gold (NYSE:GOLD) outlined in its last annual report were: the need to obtain mining permits; uncertainties about converting estimated reserves into production; having to meet stringent environmental, safety, and health regulations; the need to replace depleting reserves; and mining and insurance risks and hazards. Franco-Nevada doesn't have to bear any of these risks or costs, because it doesn't own or operate mines. Instead, it enters into streaming agreements wherein it pays the mining companies up front so that they can get operations underway, and in return gets the rights to purchase a certain percentage of the precious metals those mines produce at a low fixed cost. This simple pictorial presentation from Wheaton Precious Metals (formerly Silver Wheaton) pretty much sums up the business of streaming. That means by owning Franco-Nevada shares, investors can get as much leverage to gold prices as they would by buying a gold mining stock, but with lower risks and a higher profit potential. Aside from zero mining costs, the other big advantage that a streaming company enjoys is that it can purchase metal streams from miners at costs substantially below spot prices. In 2016, Franco-Nevada's cost of sales, or simply its purchase costs – were only around $105.8 million, against revenues worth $610.2 million. This low-cost advantage explains how Franco-Nevada and peers can beat miners in the game of margins. There's one big factor that sets Franco-Nevada apart from Wheaton Precious Metals and Royal Gold though: diversification. Franco-Nevada doesn't make money from just gold. Data source: Franco-Nevada. Table by author. Among gold assets, streams that Franco-Nevada acquired in recent years like those from the Antapaccay mine operated by Glencore and the Antamina mine, partly owned by Teck Resources, are adding significant value to the company. Over the next couple of years, Canada-based First Quantum Minerals' Cobre Panama mine is expected to be a key source for gold for Franco-Nevada as its production ramps up. By 2021, Franco-Nevada expects to generate 515,000 to 540,000 gold equivalent ounces (GEOs), which, at the mid-point, would amount to 14% total growth from the record 464,383 GEOs it sold last year. That's remarkably stronger than the barely-there growth that peer Wheaton Precious Metals has projected for itself. Franco-Nevada diversified into oil and gas only recently when it acquired $100 million worth of oil and gas royalty rights in the Oklahoma STACK play last December. It expects to close a $110 million royalty deal in the Midland Permian Basin this month. These two royalties leverage Franco-Nevada to growth opportunities in eight out of the top 20 active oil counties in the U.S., which is a pretty big deal. Not surprisingly, the company believes its oil and gas revenues could jump threefold or more in the next decade. The key to Franco-Nevada's growth lies in its ability to maintain a strong mix of streams, such that production hiccups at one or two mines won't significantly hurt the company's sales. At the same time, it must also ensure that it has sufficient interests in developing assets to replenish its portfolio of streams as older agreements expire. The company looks bang on track in this regard, judging by its existing asset base. Shareholders can also expect higher dividends going forward from Franco-Nevada's cash-flow rich business. The company has increased its dividend annually for 10 straight years, doubling it during the period. That's yet another reason why Franco-Nevada could prove a better bet than a traditional gold mining stock in the long run.